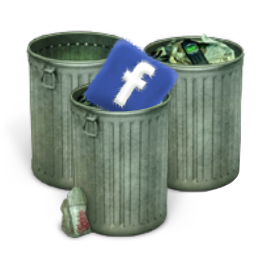 In this article I will guide you through the process of deleting your Facebook account. It is easy to just delete it, but there are things it is good to do before that. First remove all apps, then delete your account, and then don’t sign-in to Facebook in any way for 14 days. 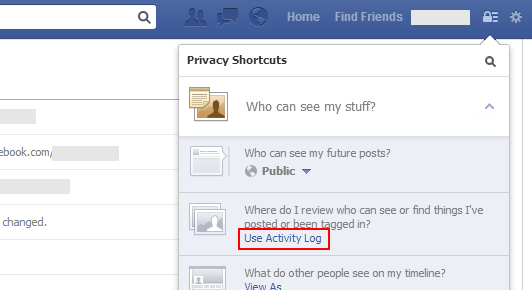 You can do it on this page: https://www.facebook.com/settings. 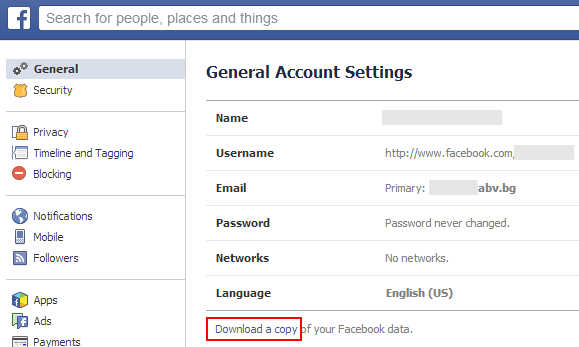 Under the settings there is a text link that says Download a copy. First you will get an email, saying that you requested a copy of the data, and then another email with a link to download the data. Make sure you can still contact your Facebook friends (or at least the important ones) via some other way. Decide if you want to undo some actions (delete a photo, a comment, unlike something). You will not get another chance once you remove your account. To view a list with your activities, click at the top right on the padlock icon, then on Who can see my stuff?, and then Use Activity Log. Finally we can do it. Visit: https://www.facebook.com/help/delete_account, click the button, enter your password, enter the text from the security image, click the button and the next one as well. Don’t sign-in in any way for 14 days. If you do it, the deletion will be canceled and you will have to do it again.